DUNCHAID O'BRAOIN, a native of Westmeath in Ireland, he was an anchorite near the monastery of Clonmacnoise until 969, when he became their abbot. It is believed that St. Dunchaid O’Braoin returned to the hermetic life for the last few years before reposing in 988. FERREOLUS (FERGÉOL), a Bishop of Grenoble who was martyred whilst preaching circa 670. FULGENTIUS, a Spanish noble and one of the leaders of the Church in the Iberian Peninsula of that era. 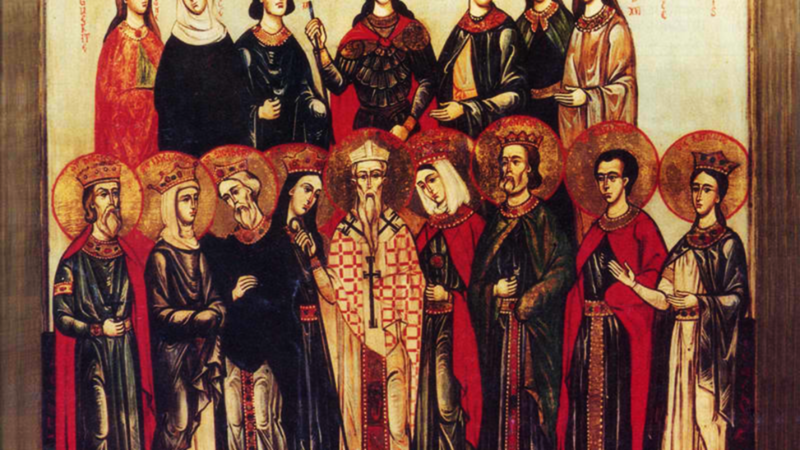 St. Fulgentius served as Bishop of Ecija (Astigi) in Andalusia and was the brother of SS. Isidore (4th April) and Leander (27th February) of Seville, and of St. Florentina (20th June). He reposed circa 633. His feast is universally listed as the 16th of January, with the exception of the Bollandists who list 14th January in the Acta Sanctorum. FURSEY, St. Fursey was an Irish monk who did much to establish Christianity throughout the British Isles, particularly in East Anglia. The son of St. Fintan, and grandson of Finlog, pagan king of the area, his mother was Gelges, the Christian daughter of Áed-Finn, king of Connaught. He was most likely baptised by St. Brendan the Voyager (16th May), his father’s uncle, and later educated by St. Brendan’s monks. St. Fursey was tonsured at Inisquin (near Galway) and devoted himself to monastic life. He later built his own monastery at Rathmat, (according to St. Bede the Venerable (25th May) this was inspired by a vision he had) in the Diocese of Tuam, now Kill-Fursa, serving as its first abbot. In time, his brothers SS. Foillan (9th January) and Ultan (2nd May) joined the community at Rathmat, though by this point St. Fursey seems to have retired from the administration of the monastery, and devoted himself to preaching throughout the area, as well as the frequent exorcism of evil spirits. Around 633, he, along with his brothers SS. Foillan (9th January) and Ultan (2nd May), travelled to East Anglia. There he was received by King St. Sigebert (25th January) (r. c. 630–635), who gave him a tract of land at Cnobheresburg on which he built a monastery within the enclosure of a Roman fort — Burghcastle in Suffolk — surrounded by woods and overlooking the sea. Here he laboured for several years converting the Picts and Saxons. He also tonsured King St. Sigebert into the monastic state. Once again, he sought the hermetic life and withdrew with St. Ultan to live as an anchorite. About a year later war threatened East Anglia, and St. Fursey disbanded his monks and sailed with his brothers and six other monks to Gaul, arriving in Normandy in 648. Once there, through the generosity of Clovis II, he built the great monastery of Lagny, approximately 25 km east of the present centre of Paris. At one point St. Fursey was deputed by the Bishop of Paris to govern his Diocese as his vicar general, which has led to some describing him as a Bishop himself. St. Fursey reposed in 650 at Froheins (Fursei-domus), whilst he was building another monastery at Peronne. His relics have been famous for miracles, and are still preserved in the great church at Peronne. St. Fursey is the patron saint of Peronne, and patron saint of the Parish of Headford. 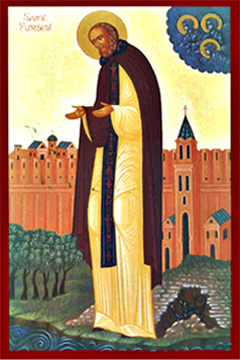 HONORATUS (HONORAT, HONORÉ) of ARLES, born in northern Gaul to a pagan as a young man St. Honoratus embraced Christianity and when to live and study monasticism in Greece, Egypt, and the Holy Land. Upon his return to Gaul, St. Honoratus founded the Abbey of Our Lady of Lérins (Lérins Abbey) on the Mediterranean island of the same name, serving as its first Abbot. In 426 he was forced to accept consecration as the Archbishop of Arles. Although he reposed three years later, during that brief period, St. Honoratus was able to re-establish orthodoxy to his see, fighting against the Arian and Manichaean heresies. HONORATUS of FONDI, (Sixth Century), the founding-abbot of the monastery at Fondi at Lazio (present-day Italy). St. Gregory the Dialogist (3rd September) wrote a brief life of St. Honoratus. JAMES of TARENTAISE, a native of Syria who received monastic tonsure and became a disciple of St. Honoratus (vide supra) at Lérins Abbey. St. James later evangelised Savoy where he served as first Bishop of Moûtiers (Tarentaise). He reposed circa 429. LIBERATA, (Fifth Century), a nun and sister of SS. Epiphanius of Pavia (21st January), and Honorata (11th January). MARCELLUS, the thirtieth Pope of Rome from mid 308 until he was forced into exile for his defence of the Faith in early 309. St. Marcellus reposed shortly thereafter, and was immediately venerated as a saint. His relics are under the altar of San Marcello al Corso in Rome. PRISCILLA, (First Century), it is at St. Pricilla’s villa that St. Peter the Apostle (29th June) is traditionally believed to have made his headquarters in Rome. She is also widely thought to have been the mother of St. Pudens the Senator (19th May). TITIAN, a Roman noble, and priest who served as treasurer of the now extinct diocese of Oderzo, near Venice, under Bishop Floriano. When Floriano was assigned to another diocese, St. Titian was selected to replace him by popular acclaim. St. Titian was a noted preacher, fought against the Arian heresy, and was a model Shepard of his flock for the thirty years he served the See. St. Titian reposed in 650. TRIVERIUS, from his youth, St. Triverius lived as a hermit first near an abbey in Thérouanne, Pas-de-Calais, and later near to the present-day village of Saint-Trivier-sur-Moignans (formerly Saint-Trivier-en-Dombes) in Auvergne which is named for him. St. Triverius reposed in 550. VALERIUS, a hermit for most of his life, St. Valerius was well-known for his wisdom and holiness of life. This led to the people of the Diocese of Sorrento proclaiming him to be their bishop, a position which, with great reluctance, he accepted. St. Valerius reposed in 453.